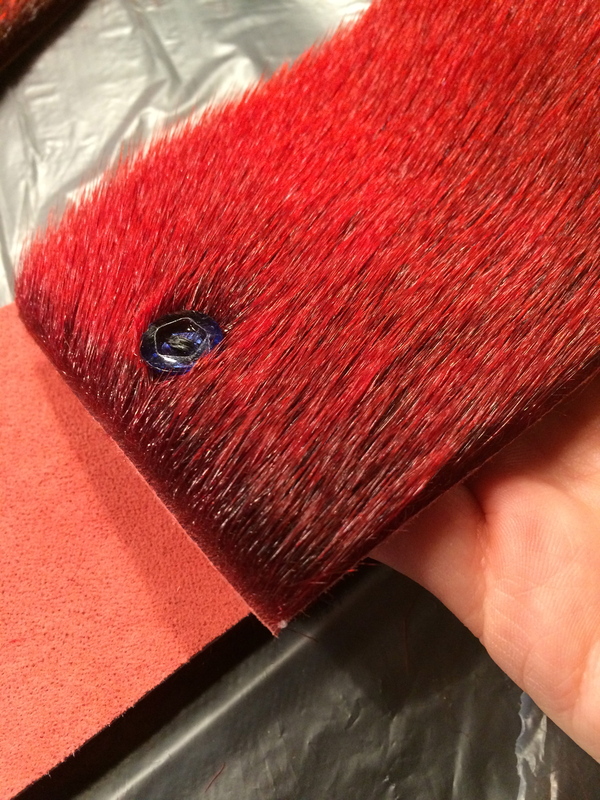 On Tuesday I tried my hand at sealskin crafts for the very first time – all in the name of love! A friend was getting married the next day and expressed that she felt her ivory wedding dress was a bit ‘plain’. The neckline was already beautifully detailed, so an embellished necklace would not suit. And then my thoughts went immediately to a colored sealskin sash! After fruitlessly looking around the shops in Nuuk, I settled on buying my own skin at Anori Art and making it for her myself. I’m a creative gal, so how hard could it be? And here in Greenland, handmade is very common. Greenlanders do, after all, make their entire national dress, called Kalaallisuut in Greenlandic, by hand. Seal hunting is a traditional element of Greenlandic culture that still persists in today’s modern life. Yes, houses with central heating and European design have replaced turf huts, but no, the ‘acceptable’ foods of the world (ex: chicken, fresh fruits and vegetables) are still not cheap in Greenland. Therefore, there is a heavy reliance on Greenland’s own land and sea for nutrition and economic income, and this includes seal. Seal hunting in Greenland is 100% sustainable as every part of the animal is used – meat and organs for food, skin/fur for fashionable yet functionally warm clothing – there are regulations for which types of seals can be caught, and there are quotas for how many can be caught. There is a very deep-rooted history of respecting nature in Inuit culture, so to assert that seal hunting in Greenland is anything but sustainable is actually quite an insult. Read more about seal hunting in Greenland at Inuit Sila, an organization whose work is dedicated to spreading the right and true message about seal hunting in Greenland. Their website is in Danish, but you can watch this Inuit Sila campaign film in English. 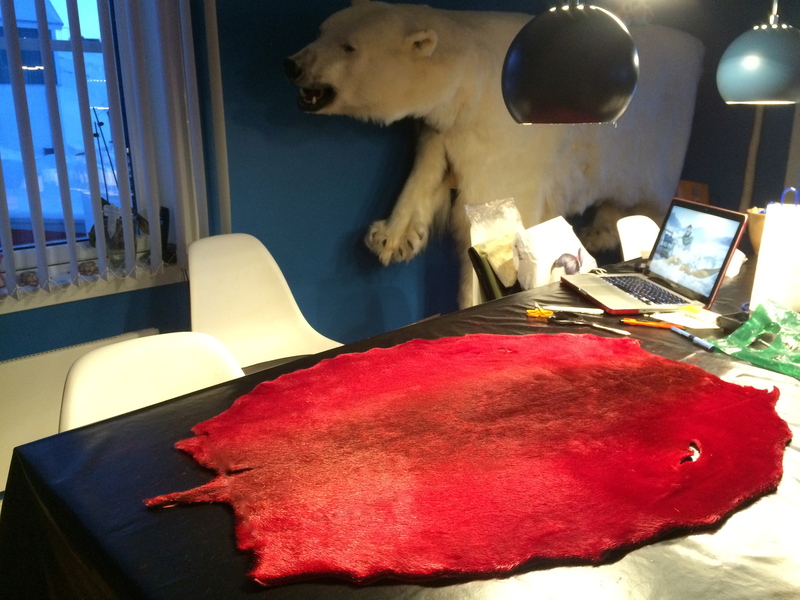 This is the Great Greenland sealskin I bought at Anori Art in Nuuk. 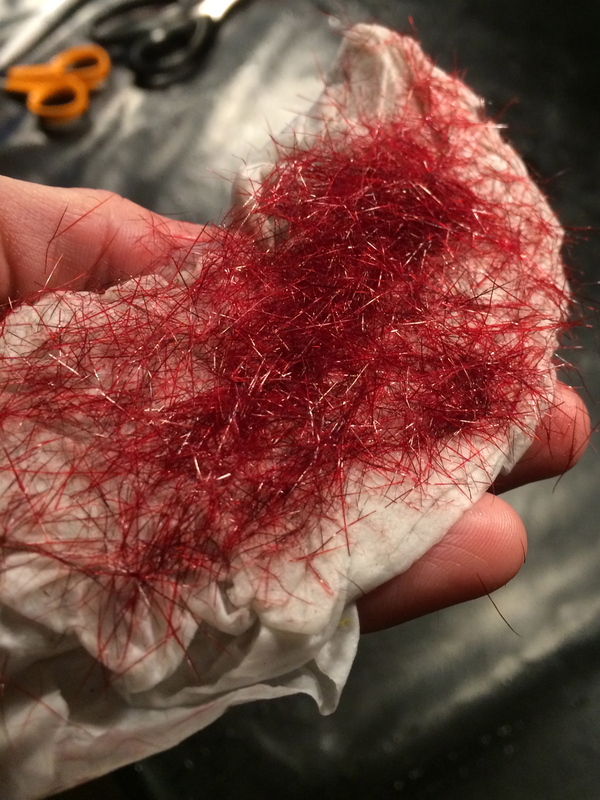 It comes from a Ring Seal (called Natseq in Greenlandic) and has been dyed red. Each skin is unique and of a different size. 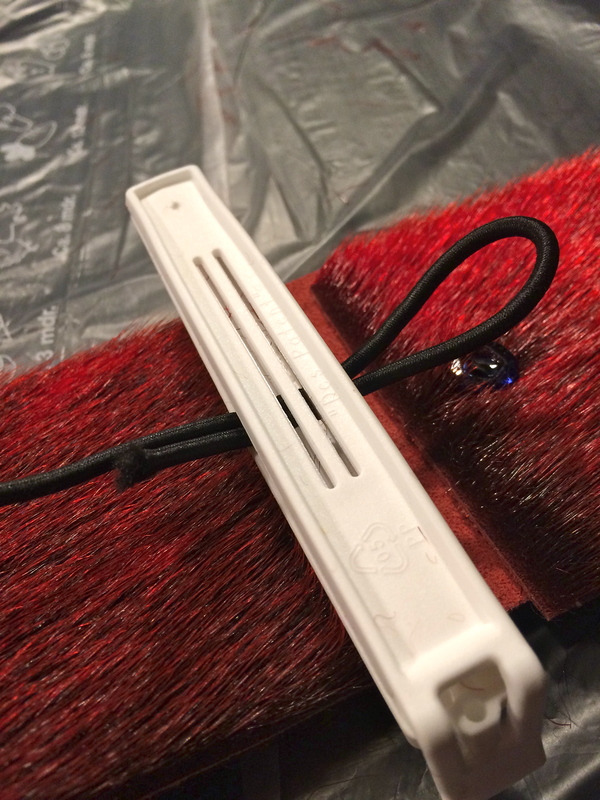 As my target was to make a sash to go around the Bride’s waist, I needed one long, thin, rectangular piece of sealskin. I cut the sealskin into pieces like so, and I used the two narrower strips that measure 80 cm x 15 cm each (31.5 in x 6 in). The tail pieces are just scraps while the three remaining pieces will be put to good use in my next sealskin creations! Sealskin for Dummies Hint: Sealskin has real fur attached, so, just like cutting hair, when you cut sealskin you will be left with quite a mess to clean up. For easy cleaning, lay newspapers or a trash bag down on your work surface before starting. 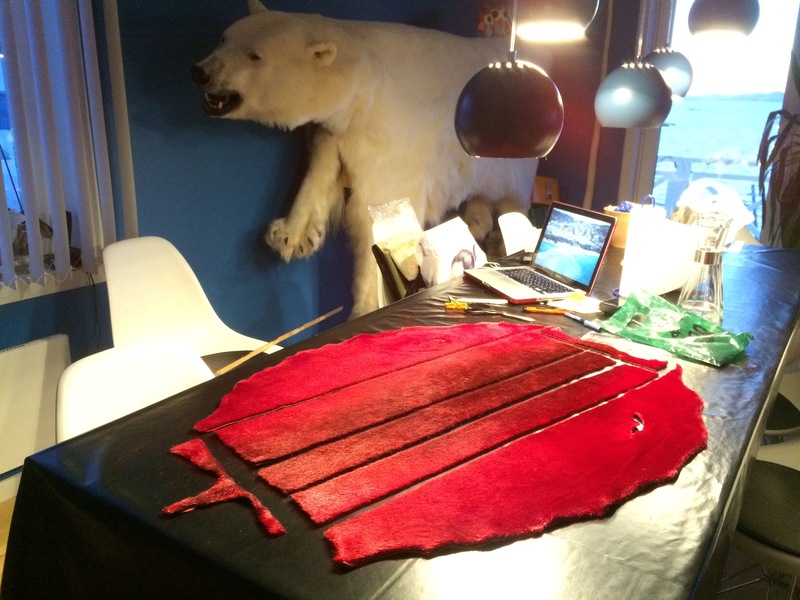 I sewed the two narrow strips of sealskin together at the short end to create one long 160 cm x 15 cm strip. The stitches are approximately 1 cm from the edge. This creates a seam in the sash. 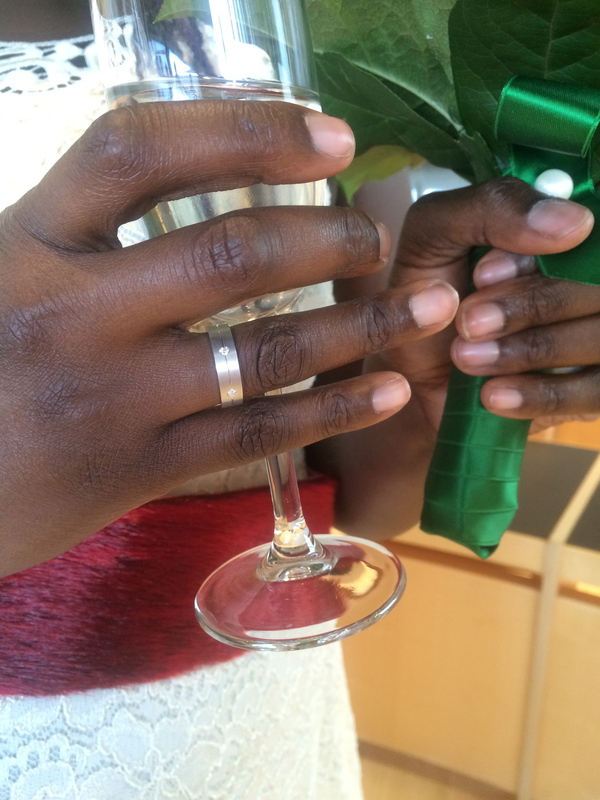 To make the seam as discrete as possible, I planned for it be under the Bride’s left arm. Sealskin for Dummies Hint: With the fur side up, make sure to match the two strips of sealskin so that the fur goes in the same direction, giving the impression of one long continuous piece of sealskin. 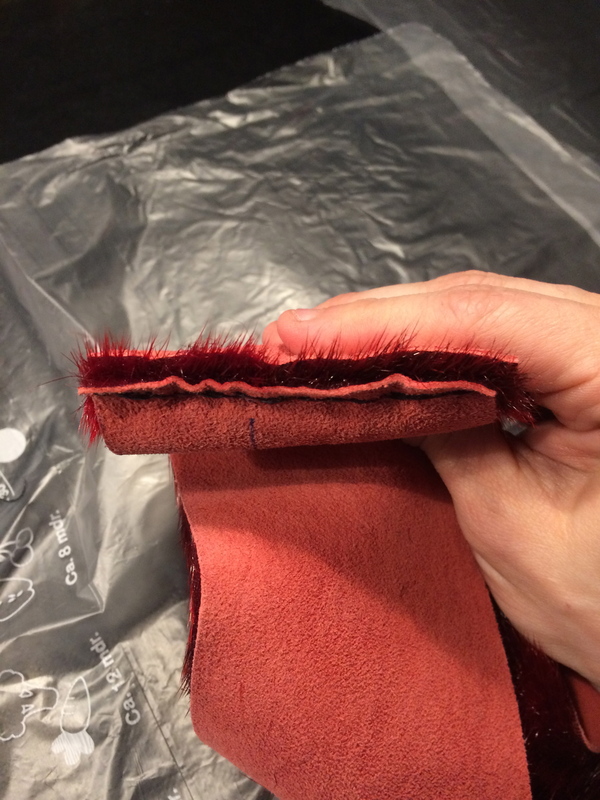 This is mostly about creating a smooth, continuous texture for the sash, as a visible transition between the two pieces of sealskin is imminent. Sealskin for Dummies Hint: Since this sash is wearable clothing and the Bride needed to feel free to sit down, stand up, dance, and hug as she wished without worrying about breaking the sash, I added 5 cm (2 in) of “wiggle room” to the length of the sash. It was perfect. I sewed a small button on one end of the sash to serve as closure. The center of the button is 2.5 cm (1 in) from the edge, which also helps use some of the extra 4 cm wiggle room. Notice that this button is blue – a special touch, as the Bride comes from a Something old, something new, something borrowed, something blue.. tradition! Sealskin for Dummies Hint: Clips really come in handy to tack pieces in place while you sew them together. Here is the closure of the sash. Notice how the loop and the button sort of sink into the fur of the sealskin so they are as discrete as possible. 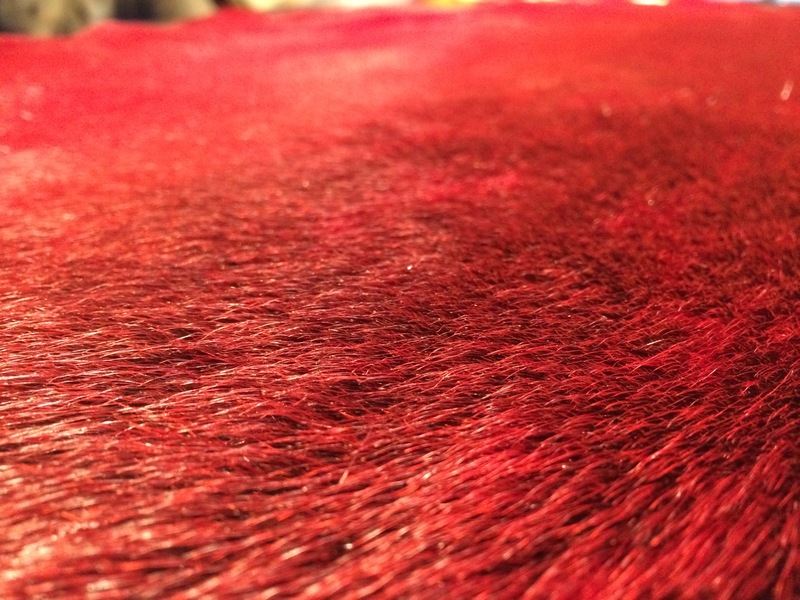 Notice also how the fur all lies in the same direction as if one continuous piece of sealskin. The Bride’s sealskin sash in action. She loves anything red, so this was the perfect pop of color that also pays homage to her new life in Greenland. Kammannguaq pilluarit! Congratulations my dear friend! This entry was posted in Greenland, Greenland - Everyday Life, Photo Galleries and tagged Arctic, Crafts, Fashion, Fur, Greenland, Greenlandic, Handmade, Nuuk, Seal, Sealskin by polarphile. Bookmark the permalink. would love to see more photos of the bride and dress. What I’ve seen looks beautiful! Here in Queensland, Australia the Country Women’s Association is studying Greenland in 2016. We study a different country every year. For a section of this study, we are ‘required’ to make some craft items which include a “Hard Craft” being a card depicting Greenland; then a “Soft Craft” making a Beanie, probably most will knit or crochet one. that the women like to create; then with the Beanie, Greenland would have knitting patterns that are a popular theme. I done a little bit of research to see what I can find and have only seen/read crafts that we are not intering into. We need to keep it simple and have members participating in this section of our studies. any origins of our Association. Really would love to have your feed back. I don’t have facebook or any of the other internet connections, just the computer online for my happy useage. Thank you for the comment and the readership! Would you mind terribly if I ask you to just copy/paste your message here into an email directly to me? sarah@greenland.com. Thank you, and talk with you soon! Wow, looks gorgeous, so does the bride from what I see. ♡ I want one of these, but perhaps the cell phone case. Love the color of the fur. I want to touch and feel it so bad, haha.